Looks like a solid seat. One adjustment would be a pad of some sort if you expect to sit on it very much. Or, even some shaping of the top to fit most butts shapes. Design wise I question the heaviness of the top and it’s stability if it gets bumped. I would expect it to tip over easily. But good designs have to start somewhere so keep at it. Is this part of some 2×4 challenge? I like the idea of shaping rather than padding. What type of joinery did you use? This is a good project idea for those shop class kids posting the step stools. I used screws for the assembly, and then pinned with a finish nail or two into the stretchers so they didn’t rotate under the pressure of feet on them. finished with a liberal coat of dust. hasn’t toppled over yet. I am planning to refine it so that it is more eye catching. It is a great way to use up 2×4 scrap. Also it actually is quite comfortable to sit on. It’s a nice practical prototype. 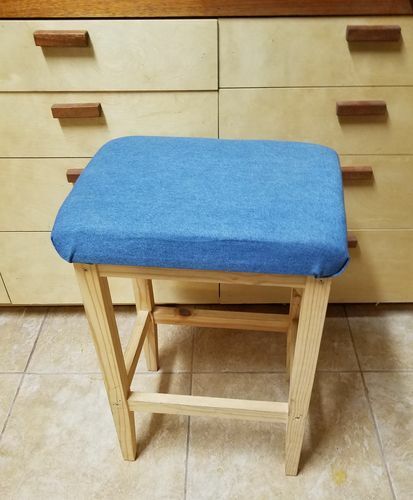 That’s a nice, practical Shop Stool!